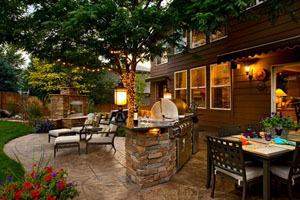 Concrete is an affordable, attractive and versatile choice for most homeowners. The big draw of concrete is the combination of style and affordable pricing. While basic concrete pads with grey, brushed concrete still work well for many projects, the trend is towards tinted and stamped concrete. Today, concrete can be poured and stamped into intricate and beautiful designs to suit any taste. 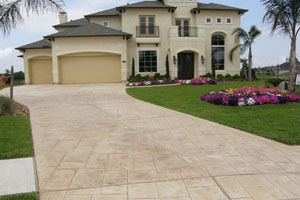 Choosing concrete is about choosing durability, low maintenance and a beautiful esthetic season after season. At its most basic, a concrete garage pad is durable and can withstand the weight of multiple vehicles over a long period of time better than interlocking stone. It requires very little maintenance and, when poured correctly by professionals, should withstand cracking and shifting. Concrete garage pads can be poured in any size for both residential and commercial properties. Building a concrete pathway is a great way to ensure a safe, durable finish for both residential and commercial properties. 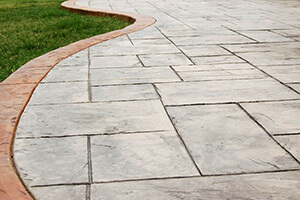 With all the options available today for both stamped concrete patterns and tinted concrete, it’s possible to design a path that is both functional and beautiful, and that can withstand Calgary’s extreme weather shifts without cracking. At Apex, we will pour concrete decks for homeowners. Gone are the days when grey brushed concrete was the only option. 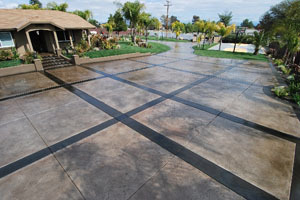 Today, homeowners can choose from a range of stylish stamped concrete patterns ranging from natural stone looks to geometric designs. Colour is also an option. Many homeowners choose tinted concrete that compliments the brick colour of their home or the surrounding environment. Unlike traditional asphalt, concrete is easy to maintain and retains its beauty year after year. With its low maintenance costs, concrete is an affordable option for homeowners. Factor in the myriad of beautiful stamped concrete designs and it’s no surprise why concrete is increasingly a top choice of designers. A concrete driveway not only wears better than asphalt, but it’s easy to maintain and resists shifting and cracking due to Calgary’s extreme weather fluctuations. 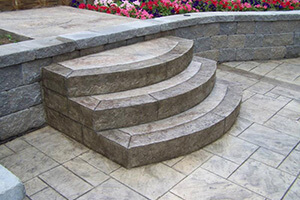 The trick is to choose a professional concrete contractor in Calgary that has the vision, skill and creativity to make your ideas come to life. Not all concrete contractors are the same, and mistakes are costly. It’s important that you choose an experienced professional concrete contractor like Apex Concrete that has a great track record and reputation in Calgary. At Apex Concrete, we are a Calgary concrete contractor dedicated to ensuring your concrete project is completed to your satisfaction. Whether you have ideas in mind or need some advice on your next concrete project, we are here to make your ideas come to life.